Lush green. Magnificent cedars. Moss-covered rocks. The setting looks like something out of the acclaimed 1997 anime Princess Mononoke. Turns out, it is. Appealing to hikers and anime fans alike, the Japanese island of Yakushima is a World Heritage site, famed for its unique beauty, wildlife, and trees that are thousands of years old. The island is quite famous in Japan and popular with tourists. Last week, it was reintroduced on Japanese site Another Tokyo. Japanese blogger Madocheese also recently checked out the island. Yakushima inspired Princess Mononoke's setting, with famed animator Hayao Miyazaki soaking in the sights. The island's Shiratani Ravine is home to an area that is know dubbed "Mononoke Hime no Mori" (もののけ姫の森) or "Princess Mononoke's Forest." There's even a sign that marks its entrance. Notice how people even bring toy versions of Kodama, the spirits that appear in Princess Mononoke, and take snaps. If you are planning on visiting Yakushima, website The Circumference recommends visiting in late autumn. You can reach the island via plane or ferry from Kagoshima City. Whenever you visit, it's a good idea to pack water-resistant clothes. 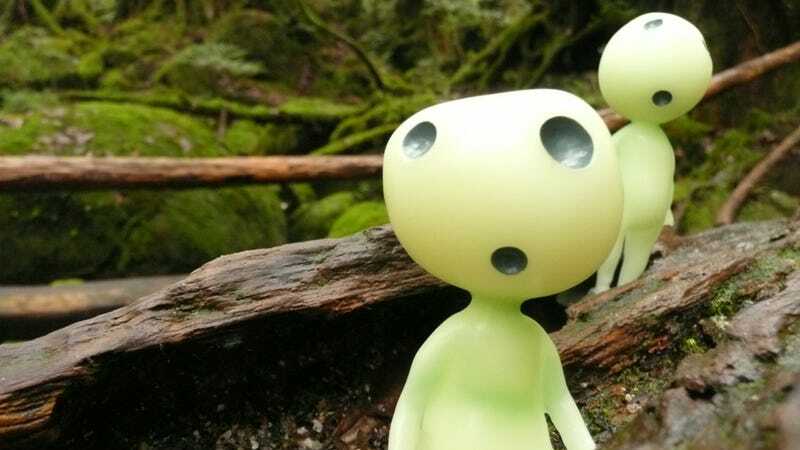 Don't forget the Kodama figurines!